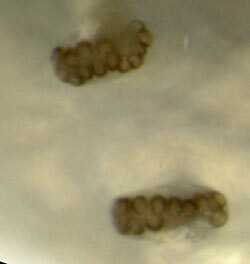 front and rear spiracula, dorsal. 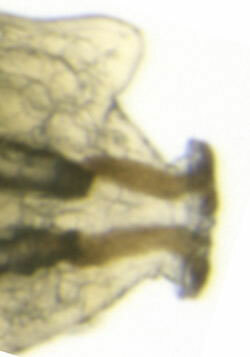 “head” and rear spiraculum, lateral. 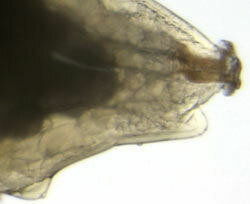 mandibles and appendage of the mouth border. The mandible has four teeth (the lowest two somewhat smaller than the upper two). The rear spircula are very close, almost touching each other. 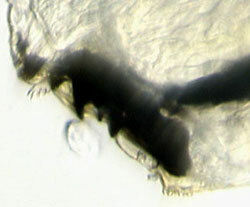 The larva is described by Sasakawa (1961a), Griffiths (1963a) and Dempewolf (2001a). The illustration of the mandible by de Meijere, (1934a: 246) contains an error in interpretation: there are no alternating, two-teethed mandibles, but non-alternating four-teethed ones. This error is repeated in de Meijere’s key of 1943 (Griffiths, 1963a) and in Darvas & Papp (1985a). De Meijere’s mistake is quite comprehensible: it is only possible to understand the situation by observing the mandibles ventrally, at strong magnifications. A. albipennis belongs to the nigripes group that was created by Griffiths (1963a), mainly on imaginal characters. 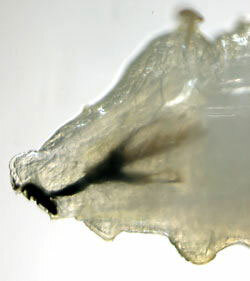 The larvae of the group were stated to be recognisable by the absence of a ventral field with small spines, immediately behind the mandibles. Dempewolf (2001a) showed with SEM photos that, at least in albipennis, such a field indeed is present, albeit weakly developed, as is visible on the photos above. Dempewolf speculates that the ‘paunchy’ shape of the anterior arm of the cephalic skeleton might be a better, derived, character to characterise the nigripes group.